A milestone in ethereal/heavenly voices history! As the ultimate collection from this legendary band, with a million tear-stained memories presents 31 brilliant tracks from black tape’s first 17 years. Limited to 2250 pieces, this 2-CD set is divided into a vocal and an instrumental disc offering fans two diverse listening experiences. Disc 1 begins with a new 2003 re-recording of the first song from their 1986 debut album, the rope (with current member Bret Helm on vocals); disc 2 begins with a never-before-heard Steve Roach remix of the song “Kinski” from 2002’s, the scavenger bride. In between, this collection contains music of legendary and beautiful proportion offering a unique blend of ethereal soundscapes, heavenly voices and neo-classical songs with a touch of gothic stylings. To complete this special release, the cd comes with a 16 page booklet of lyrics and stories from songwriter Sam Rosenthal. 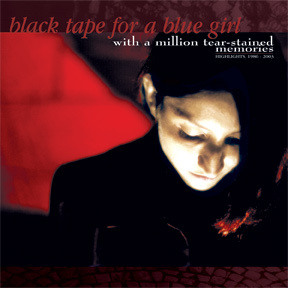 Black tape for a blue girl have a reputation as one of the few bands able to reinvent and create current music from the origins of the Gothic genre. Over the years, the band has continually reconfigured itself with new members adding their distinct talents to the band’s sound. The powerful and enchanting combination of male and female vocals propel the songs with melody and harmonies not regularly associated with Goth music. Sam Rosenthal’s touches are present throughout. His lyrics deal with an existential search for truths and understanding, setting up black tape for a blue girl as one of the few bands to take to heart the work of Sartre, Kafka and Duchamp (often all at once in a jumble of personal contradictions). His subtle and sensual electronics form the foundation upon which the other musicians’ work appears. “I see myself more as a playwright,” Sam comments. “I create the songs and the characters that populate them, bringing in others artists to add their talents to help me realize my ideas.” Setting this CD apart is the stunning work of violinist Vicki Richards, trained in the early 70’s in Indian Raga as well as western classical modes. 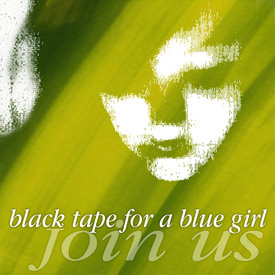 Her performances with black tape for a blue girl are an important element of the band’s overall sound, draping the music with an elegant and passionate classical aura; reaching a pinnacle in the suite of songs that conclude disc 2.